There are thousands of different species of fleas throughout the world, here are the most common ones that are in America. These creatures attack both pets and humans and inhabit their furs, our hair, and homes. Chicken Fleas – As their name implies, these fleas love infesting and living on chickens. They live and breed in the chickens coups, and attached themselves with their heads buried into the skins of the chickens. They can be seen around the faces and heads of the chickens when examines closely, as they appear as blackheads, or small black nodules. When you enter a coup to gather eggs, or clean it, or even to simply visit your chickens, you can become a temporary host for these biting pests. Rat Fleas – Northern Rat Fleas – These nasty little critters are always feeding off the blood of rats and mice. If you have a pet mouse, and have often spotted it scratching it’s self, or seen fleas on it, these are very likely the culprits. They favor the blood of rats and mice, but like most other fleas, if brought around humans they will also feed of the blood of people. 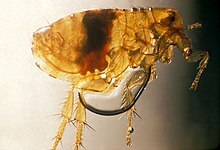 Oriental Rat Fleas – As their name implies these fleas were brought to Europe and America onboard ships from the orient. 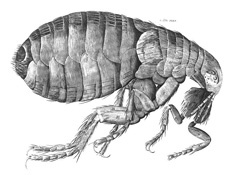 These are the nasty fleas that were responsible for the great black death (plague) incident that killed millions, it is estimated to have killed 30% to 60% of Europe’s population. These fleas are now common in America in coastal towns, and cities, and even along rivers. They often infest not only rats, but raccoons, opossums and other animals that live near these same areas. If you go fishing, and find a flea crawling on your arm, or some other place, it will probably be an oriental rat flea. Human Fleas – Most folks will tell you people do not become infested with or get fleas! This is not true at all, in fact there is a species of flea called the: Human Flea. It looks very similar to any other flea, except under a microscope. This type of flea likes to infest the hair of humans, it easily finds a host by hiding on the backs of seats of buses and other vehicles, and hitching rides in the hair of new passengers. These fleas love to infest hairy areas of people such as the heads, under the arms and other areas. They live quite well on people, and gorge themselves off the blood. Human Fleas are not that common anymore, thanks to better hygiene and cleaning methods, but they are still out there. 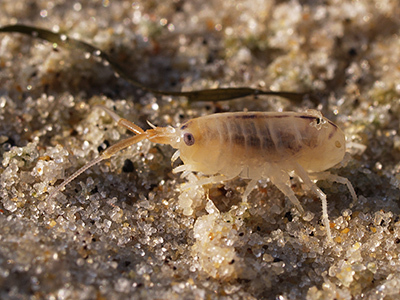 Sand Fleas – These are the little villains that often bite your ankles when at the beaches. When you lie down on the sand, they will bite any body part that is close to the ground. They are one flea that looks different then most others, in fact their appearance is more like that of a very tiny shrimp-like creature. Sand fleas feed on organic and dying plants, especially seaweed that washes up on a beach. If you are near the beach, these fleas may be found any place there is sand, but if there are little piles of washed ashore seaweed, or other vegetation, this is a hotspot to pick up some sand flea bites. I have noticed 2 different types of fleas on my dogs, one kind are small little black fleas, while the other type of flea is a bit larger in size and has a red tint to their color… What type of fleas are these and are they really different or are the smaller black ones just the babies? Wow, i never knew there was that many types of flees. What can we do to rid our dogs and home of flees ??? Help please!!!!!!! i am not sure what kind these are or where they came from but they are in my home and they look like almost flat like fleas when they are on me sometimes they leave a red dot but it does not itch at all let alone i do not feel it biting they tend not to have the best balance and flip on there back or side and try to get back up. the dots it leaves are not anything like what you see on the internet i wold get like 1 2 or 3 on me than the dots world go away after like 20 min to 1 hour and i my cat did not have fleas when i spotted the fleas we put the flea stuff on the cat there were not any fleas on us but the thing is we live in miss. in the wooded area more not in the city can that also be why if you can help me out that would be very much appreciated. thank you .